The first in a series of virtual Baldwin pianos is a recreation of our studio's 1954 Baldwin "R" series grand. Baldwin pianos, from the big grands to the Acrosonic spinets, have always been favorites of ours, and we're happy to bring that Baldwin sound to the virtual piano market. Now Baldwin can stand alongside brands like Steinway, Yamaha, Bechstein, Fazioli, and Bosendorfer in your virtual instrument arsenal. It's a piano that's versatile and expressive, packed with the features that we thought could really express the piano's musical story. Used straight out of the can, the close mics yield a bright, bold sound, but alternate mic perspectives and full dynamic control give you a wide range that allows you to create everything from gentle, evocative soundscapes to pounding rock tracks that pop out of a mix. The demo and the full version are available for immediate download on our downloads page, but keep in mind that you'll need to have an I-lok account and purchase an authorization code to unlock the full version. The demo version can be used immediately, with no restrictions. It has ALL the features of the full version, but a gentle chime will sound every 15 seconds to remind you that you're running the demo. Both the demo and full version require either the free UVI Workstation or the not-so-free UVI Falcon to be installed on your system. adjustable custom convolution reverbs, "air" and "wood"
The close mics give a clear, bright, strong tone that'll stand up in the densest mix. The mid-distance mics capture a nice balance of piano and room ambiance with a natural stereo picture. The far mics carry a ton of ambiance, reflection and diffusion that can be blended in for a more evocative feel. Use the 4-channel mixer to blend perspectives and get exactly the sound you want. The instrument's got a slew of features, including compression and eq specifically tailored to work well with the piano's acoustic footprint and dynamic envelope, providing just enough processing to shape the sound in musical way. Samples of pedal up/down, and key release layers add detailed realism, while custom-built convolution reverbs allow you to dial up or down specific sonic characteristics of the piano. Key release samples are presented in two separate layers - "hammer fall", which is the sound of the hammer falling back into resting position, and "damper drop", which is the sound of the damper dropping onto the resonating string. The "Air" control provides a breathy string resonance, while "Wood" adds more clunk, more deep physical presence. The amount of open string resonance when the sustain pedal is depressed can also be dialed up or down with the "sustain resonance" dial. 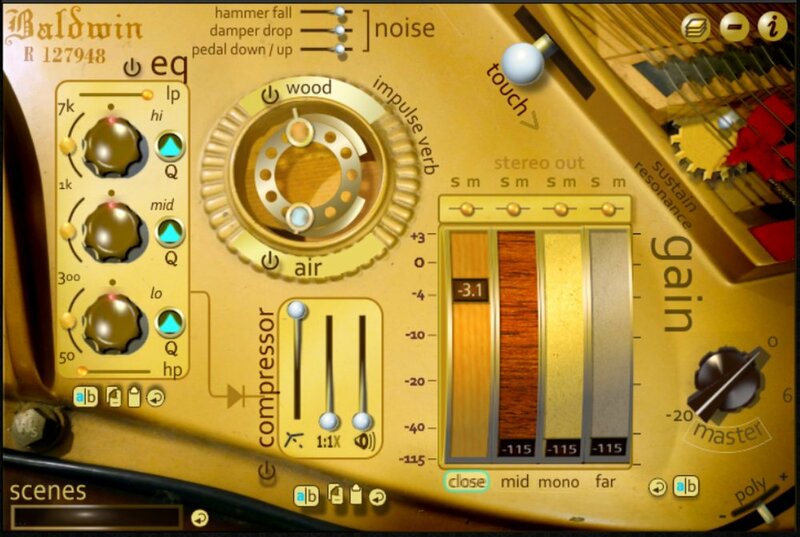 The interface comes with A/B, copy, paste and reset buttons for many of the parameters, and "save scene" and "load scene" buttons to allow you to save entire parameter sets and load them in an instant without having to reload the entire instrument. "Polyphony" allows you to determine the maximum number of samples triggered simultaneously. A global reset button returns ALL the adjustable parameters back to the default setting.